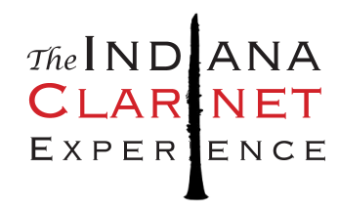 The Indiana Clarinet Experience Faculty represent some of the most enthusiastic young educators in the Midwest who maintain active performance schedules and large teaching studios. Learn more about each member below. Staff Sergeant Erik Franklin is a member of the U.S. Army Field Band, the musical ambassadors of the Army. Prior to joining the Field Band in 2016, Erik held positions with the Terre Haute Symphony Orchestra and the Columbus Indiana Philharmonic. He also served as interim Instructor of Woodwinds/Music History at the SC Governor’s School for the Arts and Humanities. He is the founder of the Novacane Quartet, an award-winning group discovering new avenues for art music in America. Every summer, he hosts the Indiana Clarinet Experience—a weeklong music camp in Brown County, Indiana. 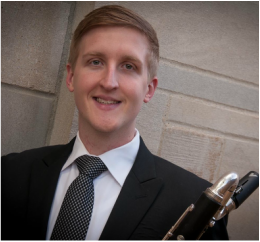 A South Carolina native, Erik earned a BM in clarinet from Furman University and MM in clarinet from Indiana University’s Jacobs School of Music, studying with Howard Klug. ​Erik lives in Silver Spring, MD with his husband. When not traveling the country with the Field Band or the Novacane Quartet, he enjoys exploring museums and monuments in our nation’s capital. Chris Dessent is a music teacher and performer, specializing in several instruments and music genres. His main instruments are clarinet and saxophone, and he plays the guitar and electric bass as well. Chris is versatile in both classical and jazz styles, as well as rock, pop, and other genres. A graduate of the Indiana University Jacobs School of Music, Chris received a Bachelor’s Degree in Music Education with High Distinction, studying clarinet with Howard Klug. Currently, he is a band director at Fishers Junior High in Fishers, Indiana. He has experience teaching and performing with award winning concert bands, jazz bands, marching bands, orchestras, and chamber groups in Chicago, Indiana, and Ohio. Chris’ outside interests include exercising, reading, traveling, and cooking. Kylie Stultz-Dessent is currently pursuing a Doctorate in Clarinet at Indiana University's Jacobs School of Music, studying with James Campbell. She received her Master's degree in 2014 from the Cincinnati College-Conservatory of Music and graduated with high honors from Indiana University Jacobs School of Music in 2012. As a performer, she has attended international music festivals such as Orford Summer Academy, Windfest, and the Banff Centre Masterclasses. She is a member of the award winning Novacane Quartet, a innovative group dedicated to performing chamber music around the country. Kylie regularly performs with local symphonies in Indiana and Ohio and in 2010, she performed as a guest soloist with the Columbus Symphony Orchestra in Columbus, Indiana. In addition to performing, Kylie is a dedicated and passionate clarinet teacher. Her students have placed in All-State ensembles, received top ratings at solo festivals and competitions, and have successfully auditioned for prestigious music schools. She is currently serving as adjunct Instructor of Clarinet and Chamber Music at Ball State University in Muncie, Indiana. In addition to her position at BSU, she is the clarinet instructor at Columbus North High School and Carmel High School in Indiana. Every summer Kylie directs the Indiana Clarinet Experience in 2014 - a six day clarinet summer camp in Brown County, Indiana she co-founded with fellow Novacane Quartet member, Erik Franklin, in 2014. Kylie splits her time each week between, Columbus, Indianapolis, and Muncie Indiana. In her free time, she enjoys spending time with her husband, Chris.